We are Gary and Maria Elena. I was born in Miami, Florida and my wife has lived here for many years. We love the beach, especially the South Beach area. We purchased the studio for a get away place and also enjoy renting it to people and sharing what So. Beach has to offer. I worked for the City of Miami as a computer programmer, and I am now retired. My wife retired this year (2017) from Florida Christian school where she was a teacher, then an Elementary Principal for the last 10 years. She served at the school for 36 years. We have 2 adult children and 3 grandchildren. We love and enjoy our family and our American bulldog "Sophie". 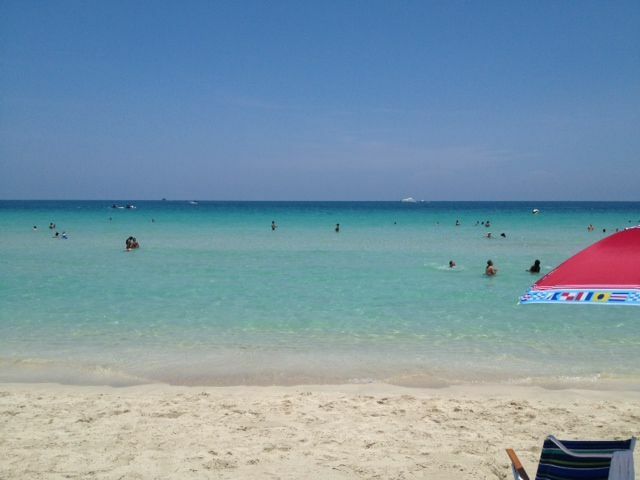 South Beach has always been a favorite area of ours. We have seen it grow and be renovated the past few years. This area is historic and holds many memories of us going there to the So. Point as a teenagers. We were very happy to be able to purchase the studio in Ocean Dr. and, not only enjoy it ourselves, but also share it with people around the world. Ocean Drive is a unique Art Deco and historic area. Ocean Drive is a world famous street with many clubs, restaurant and entertainment. Also to the south of 5th street you can enjoy a more quiet tranquil beach atmosphere. You can go biking, go to the peer and walk down the water way to see the cruise ships coming or going out. Also, you can eat at Smith and Wollensky by the water way or walk down to Monty Trainers for a casul dinner by the bay and watch the beautiful sunsets and yachts. The studio is located on the ocean side. Go to the pool and exit to the beautiful beach just a few steps. You will find it in the lobby area. The room was as advertised. The location is great for a quite holiday, which is what I wanted. Most of what I needed was within easy walking distance. The hosts were very helpful. Thank you for your review. We appreciate your input and it was a pleasure meeting you. Hope to see you again in the future. Owners nice and property has everything you need. Literally steps to the lovely beach with so much within walking distance. Thank you for a good experience! We were in town for a cruise so the small quarters got us primed for a small ocean cabin! We loved this place. On our own beach. Had a pool. Our friends stayed up the street about 10 blocks . They paid double and had to walk 4 blocks to water. They had chairs towels toys and cooler we could use to take down. Next time I would do it again. Great place! We had a great stay at this condo! The owners are super nice and have a well kept condo. It was in a great location with private access to the beach. The area is close enough to all the action but still far enough away that you get a good nights rest! Highly recommend staying at this condo if you are looking for a spot to stay in the area. Also 2 blocks down is a great restaurant called the pink dot! Highly recommend heading down there when you are looking for a quick bite to eat! Thank you so much for your review! We are so glad that you had a great stay and were comfortable in our studio. We enjoyed meeting you and hope to see you again in the future. A good base from which to explore Miami Beach. Thank you Gary & Maria! A good base from which to explore Miami Beach! Gary and Maria were waiting for us even though we were late due to delays at the airport. The 150 bus is about 35 minutes from the airport to Washington & 5th Street, and from there it is a 5 to 10 minute walk to the studio. We were allowed to check in early, which is great when one has luggage to contend with. The studio was clean and ready for us and has a microwave, fridge, coffee maker, hot plate, hot showers, a comfortable bed for two, Wi-Fi and a television. Everything you need really. It is a 5 minute walk to the free trolley stop at Washington & 4th Street. The trolley is great for making your way around South & North beach, & one can use it to get to the Publix supermarket at Alton & 6th Street. The area is safe & quiet at night for sleeping. The key fob gives access to the beach behind the condominium and there is a small pool. The owners, Gary & Maria were very nice to deal with. Thank you Gary & Maria! Gordon, Thank you so much for taking the time to give us a review and pertinent information on different locations and services. This will be very helpful for other guests. We are so glad that you had a good visit. You and Eva are a delightful couple and we enjoyed meeting you! Hope you come back and visit us again. Ocean Drive is a famous street. We are on the south point, the quiet areas, however you can find all the restaurants, attractions, clubs, and all the excitement within a couple of blocks to the north. You can also walk to the south pier and watch the cruise ships go by and relax on the South Point Park. You can then dine on the restaurants by the water way. We personally like to walk to Smith and Wollensky restaurant from the beach or walk to Monty's at the marina. Perfect location to relax or party!! Send the security deposit to reserve unit. Rental fee at arrival.